What makes a PaaS a PaaS? I’ve seen many discussions on blogs and twitter around this topic, so much so that many people are tired of talking about it because it always leads to cyclical discussions. I for one haven’t been satisfied with any of the answers that I have seen. Some people try to define PaaS with requirements such as it must be on demand, while others say that an API and services need to be exposed. I disagree with these requirements/constraints on describing PaaS. 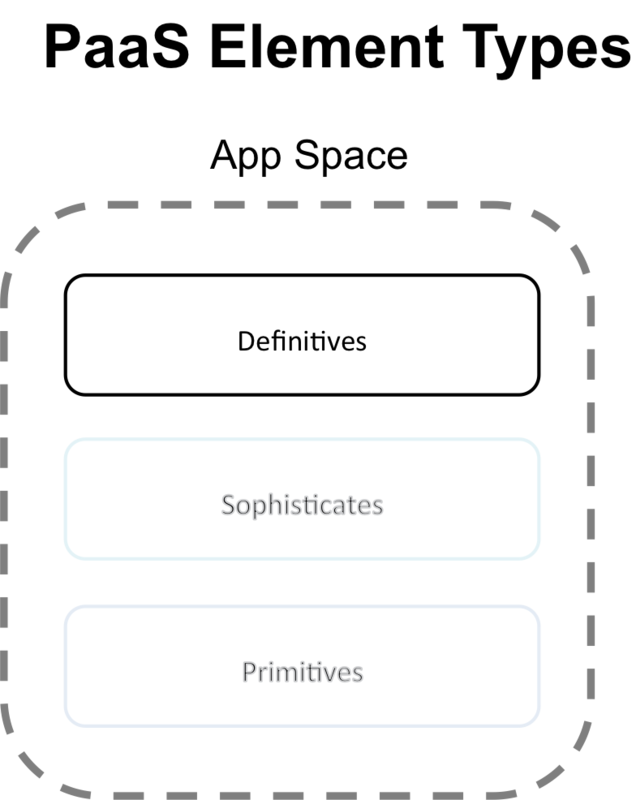 I think there is a model should be applied to define what is PaaS, to make this model credible there is a necessity that it can be mapped to most (if not all) current and future offerings defined as PaaS (Which will be a follow-on series to this post). The PaaS Model is made up of two different constructs, which are called Spaces. These two Spaces serve different purposes, but are composed of the same PaaS Element Types (elements will be explained in detail, in an App Space deep-dive follow-on post). The Control Space and App Space are show in the diagram below, notice that the App Space is fully wrapped/contained within the Control Space. The Control Space performs all of the automation, management, provisioning that is required by the PaaS. Interaction with other lower level components such as an Orchestrator is achieved through API abstractions if/when necessary. The Control Space and its implementation also determine what elements are allowed/exposed to the App Space. Further, the Control Space is responsible for maintaining App Space coherency and dependencies. While the Control Space is comprised of several separate functions, they may be combined in different manners depending on the specific PaaS implementation. All of this will also commonly be exposed through one or more API interfaces (this however, isn’t necessarily a requirement in the model presently). The App Space is where end-user/customer applications are deployed, updated, and run. The App Space is controlled (and commonly coordinated) by the Control Space. The exposure of PaaS Element types by the Control Space to the App Space is one of the key differentiating factors between different PaaS implementations. App Space characteristics are controlled by how the Control Space is built/designed along with what PaaS Elements were used to build the Control Space. 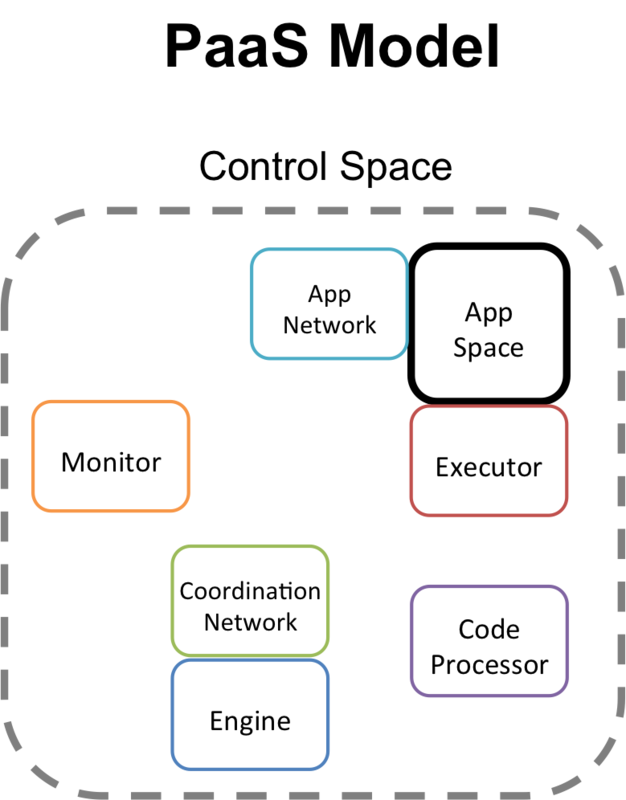 App Network: The path which applications communicate with app each other and services/resources exposed to apps. The App Network exposes Network connectivity to the App Space. Executor: The application bootstrapping mechanism for apps being or currently deployed. The executor provides compute/memory resources to the App Space. Code Processor: Examines code, libraries, and dependencies before sending to the Engine and/or Executor. This can also be thought of as a code inspector or post/pre-processor. Coordination Network: Where the Control Space components communicate/coordinate with each other. Think of this as a management network that is in most cases out-of-band from the App Network. The Coordination and App Networks could be combined, however in a production system this would introduce too large of a security risk. Engine: Coordinates the distribution and provisioning of code, services, and their dependencies (most frequently in the Control Space). The Engine decides the where and how of what happens in the App Space. 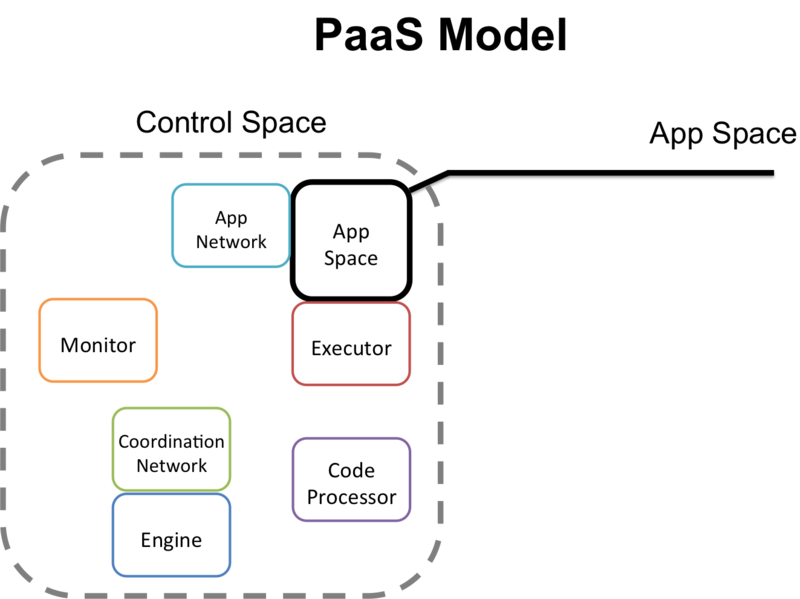 Also, the Engine may be capable of coordinating with an Orchestration Layer or other automation tools outside of the Control Space to provide new/additional resources to either/both the Control Space and the App Space. Monitor: Looks at the state of the App Space and the Control Space, signaling other Control Space components to resolve conflicts. The component most likely to resolve conflicts would be the Engine or a specialized component designed purely for conflict resolution. Notes: These components/functions may be grouped differently based on the specific PaaS implementation. Also, some of the functionality or components could be put into an API, split into sub-components, or even externalized through/in a Client or Client side API. Please note there will be an in-depth post on PaaS Elements following this blog post. I would like to give a special thanks to Shlomo Swidler (@shlomoswidler) and Derek Collison (@derekcollison) for providing valuable feedback in several draft iterations of this post. Most people currently portray the Public Clouds as a stack consisting of IaaS, PaaS, and SaaS. Worse still, they try to define Private Clouds in the same way. In a discussion I had with Christofer Hoff – @Beaker he accurately pointed out that this isn’t entirely the case, that they are all really Integrations. This blog post was about three sentences in when a discussion broke out on Twitter regarding IaaS and ultimately where IaaS and SaaS converge – hint: PaaS. IaaS is becoming established by many Public Cloud providers by providing Virtual Machines, Block Based and File Based Storage, Databases and Key Value Stores, and several other core capabilities. As these capabilities become more sophisticated and their complexity increases, the drive to abstract and re-simplify pushes IaaS toward PaaS. IaaS is beginning to also take root in Private Clouds (Enterprises) where there is a motivation for more automation and self-service in an attempt to drive more efficiency. What Private Cloud providers (I’m thinking of IT) will find is that they are unable to achieve the same levels of efficiency that Public Clouds can. The difference between Public Cloud IaaS and Private Cloud IaaS efficiency isn’t entirely based on scale as you might initially think. The disparity is also driven by the storage philosophies that they follow or rather the difference. Public Cloud IaaS is driven by very cheap and very scalable storage using software based redundancy with many replicas of data (think multiple copies on JBOD). 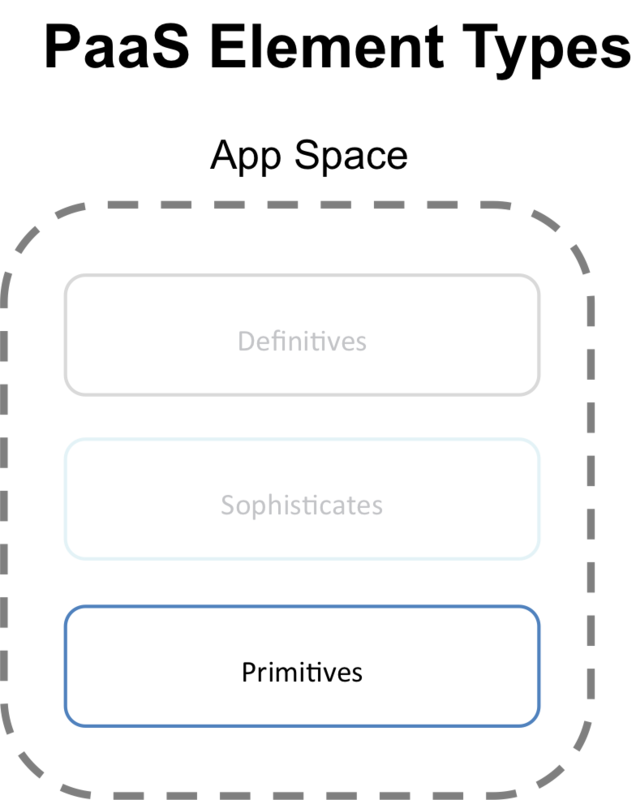 Private Cloud IaaS in contrast is driven by highly available, fault tolerant, hardware redundant disk arrays (think SANs). This difference in storage methodology translates into a difference in Platform Methodology, Applications Methodology, and Operations Methodologies. 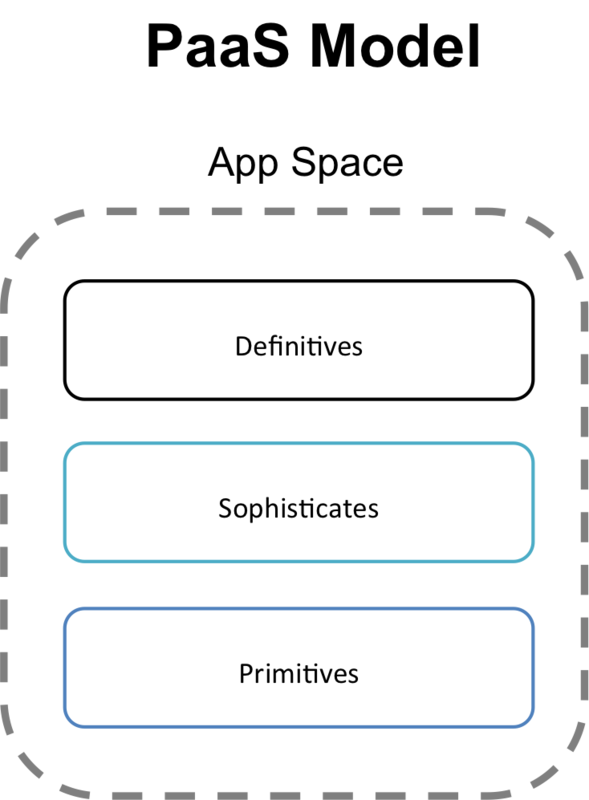 Data is king and the assumptions that are made around how data is persisted and retrieved drives decisions about platforms, applications, and operations. When Private Clouds embrace some of the newer approaches in storage, they will also embrace change in their Platform, this is where PaaS enters the picture in a big way. PaaS will also be pushed by applications developers because of the increases in productivity and efficiency that it brings to Enterprise Development Organizations. The changes to the Enterprise Development Orgs mean changes to Application Design Methodologies. These changes will drive IT to make changes as well because previous Operations Methodologies will no longer work (I’m looking at you traditional ITILv3). There will also be deep security implications to all of these changes, however this will neither make security better or worse, just applied differently than it is presently. We’ve covered the IaaS angle and how it pushes toward a PaaS centric world, but what about SaaS? I find it interesting that SaaS has been with us for 10 years now, yet many people are just realizing its value. The defacto example of SaaS is Salesforce.com. Virtually every article that talks broadly about SaaS mentions them, mainly because almost everyone has heard of Salesforce and has probably interacted with it at some point in their career. Public Cloud SaaS has several issues that it struggles with, two of which are the need to maintain a shared infrastructure in order to keep costs low but still keep customer data separate. The second issue being the need allow customers to customize the solution to meet their needs (this could be through integrations, add-ons, or other applications). 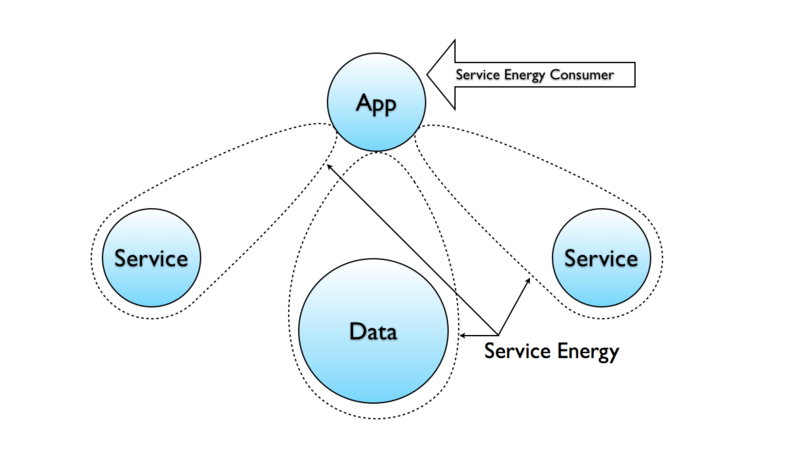 Making this work if you are simply delivering pure software as a service is difficult if not impossible. This has led Salesforce and other providers to slowly transform into more of a Platform that offers Software and less of a traditional or pure Software as a Service solution. Public SaaS Cloud moves toward PaaS because of customer demands for isolation and customization, but what about Private SaaS Clouds? Private SaaS Clouds are more about the delivery and management of the software by IT. This pattern of an Enterprise being its own provider or contracting to a Hosting Provider for these services will still drive them to want capabilities that are not out of the box. This drive will lead them down the PaaS path as well. PaaS no matter what it ends up looking like is much closer to what the end state looks like than IaaS or SaaS. Anyone who followed Cloud Computing last year watched several changes occur throughout the space. These changes were happening in the view of what Public, Private, and Hybrid Clouds were defined as, the interest in IaaS solutions in the Enterprise and within Service Providers, and finally a renewed interest in the potential of PaaS. Currently Public PaaS solutions are focused on core compute functionality and persistent services all of which are being backed by some mix of IaaS (with or without Virtualization, more with than without though). Why are so many Public PaaS focused on their IaaS underpinnings? Two reasons come to mind, IaaS is easier for customers and IT to understand and yet generic enough to have the broadest appeal. This is important in the continuing evolution of the Cloud market as a whole, we need the widest adoption possible early on for any Cloud Platforms to take off. Now, focusing in on the set of events around PaaS in the past year brings us to the rumors that surrounded EngineYard’s acquisition by VMware (which never happened and now we see that Amazon is working with them on a Ruby on Rails Elastic Beanstalk), Heroku was acquired by Salesforce.com, VMware announced the Open PaaS solution, and Microsoft will fight with anyone who calls Azure anything but a PaaS. All of this Public facing PaaS news sounds great, but I’m sure you are thinking how does this translate to Enterprise? I wondered this same thing and began to try to figure out just where it all leads. What is the Future of Enterprise PaaS? Public Cloud Services are always different from Private Cloud Services, many people think that Hybrid is something easy but miss the nuances involved with implementing Hybrid Clouds. I’m not saying that achieving a Hybrid model is impossible, just that there are many hurdles and few have working solutions that seem to address most or all of them. PaaS in an Enterprise will operate as a Service Oriented Platform. That sounds like a silky smooth sentence doesn’t it? But there is substance behind the statement. Today the most advanced Public PaaS platforms are focusing on generic, on-demand, multi-tenant, infrastructure components, and other core capabilities. What Enterprises will need for PaaS will be this plus many other services including specialized components such as vertical specific ERP and CRM solutions exposed as services, legacy solutions with service bridges, Big Data service connectors, and many more. As these capabilities get built and each former “Silo” gets exposed as a service a Platform will emerge. Something to understand is that each business is different, it was formed differently and while it operates most likely in a similar fashion to other businesses in that market, it is still different. This difference becomes even more pronounced when the needs are pushed to IT (Operations and Development). This would be the equivalent to the Butterfly Effect in IT. Why does the Butterfly Effect matter for an Enterprise Service Oriented Platform? Because it means that each Enterprise Service Oriented Platform will be DIFFERENT than all others (maybe only marginally, but still different). Each service exposed to the ESOP will be a new capability that Devs can leverage as they put together Apps on top of the Enterprise PaaS. Something that may be important to realize is that IT Operations may view the solution as an ESOP while Devs may view it as an Enterprise PaaS. I think both of these are actually correct and will talk about the same thing, it is just how it is being viewed and by who, but it is still the same thing. Hybrid Clouds will be Public Cloud services that are exposed either directly or indirectly to the ESOP. The ESOP will have the control, authentication, metering, and likely the QoS. The EPaaS will have the allowed/exposed services and resources from the Public Cloud. This will be at a different level than simply pushing and pulling VMs, Virtual Hardisks, or Creating VPNs. There are many definititions of PaaS that I have run across, the most succinct of which is “A Service where Code is uploaded and executed”. While succinct, this leaves a lot of “wiggle room” for what PaaS really is. The secret is PaaS isn’t one thing, it is a broad array of things that can be used and mixed together. 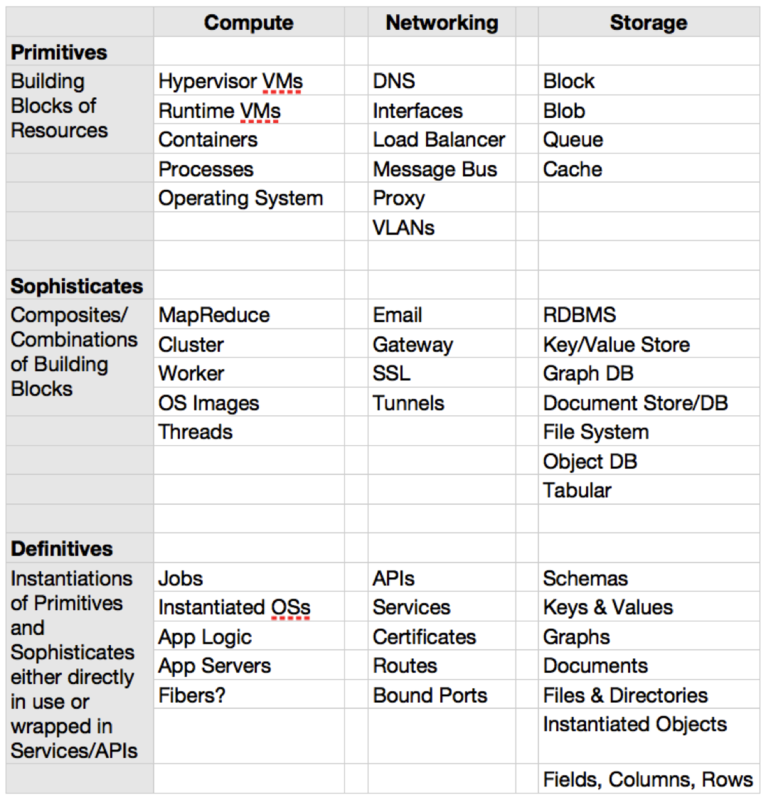 What model ore TYPE of PaaS determines what capabilities and limitations the platform will have. This PaaS is where an environment is already provided and you are uploading and executing an Application that was written/is supported by that PaaS environment. This could be a preconfigured Amazon EC2 VM, a RackSpace Cloud VM, Microsoft Azure Role, or any of the other dozens of Cloud providers. PaaS here is presented as a container that is more restricted than a traditional environment and is more stringent on code. This could be a Java WAR file for example that leverages a container such as Apache Tomcat, Amazon’s Elastic Beanstalk is a good example of this. The solution could also just be a custom JVM such as the one that Google App Engine uses (where your App is a JAR). Why is this different than a Type 2 PaaS? It is a container in an environment, not just an OS environment like Linux or Windows. This type of PaaS allows source code to be uploaded where the compilation happens in the PaaS itself. By accepting the code as the uploaded payload a greater level of insight as to what the resource requirements are of the code can be gotten, which offers more versatility from the platform. An example would be VMware’s Open PaaS (which is in Alpha currently). Open PaaS accepts many different code types, looks at what the requirements are and adjusts the environment based on what the needs of the code are. Other examples include Heroku and Engine Yard, both do Ruby on Rails. When the Ruby on Rails code is uploaded for example, then a MySQL server instance is created to support the application amongst other things that happen. Nearly everything that is needed is allocated automatically on demand. PaaS here would only allow specific code which is designed to work as logic or an extension of the Platform is allowed. While this is a highly restrictive form of PaaS, it can also be powerful and is a natural move for a Software as a Service provider looking to allow cutsomization. 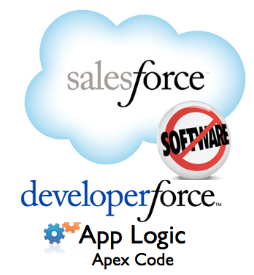 Salesforce.com is a great example with their App Logic using Apex Code. Apex Code allows a level of customization and extension to the Salesforce solution using their own blended Java/C# like syntax. The future of PaaS is in leveraging many of these models to best meet design decisions and customer needs. The biggest question will be what happens in the future when Enterprises want to adopt and adapt PaaS in their Data Centers. While the economies of scale will always be with Public Cloud PaaS providers, there are benefits to having PaaS implementations inside the Enterprise. In my next post I will talk about where PaaS could go.